The Hydro-Probe microwave moisture sensor has a built-in choice of connection options using either analogue or serial. 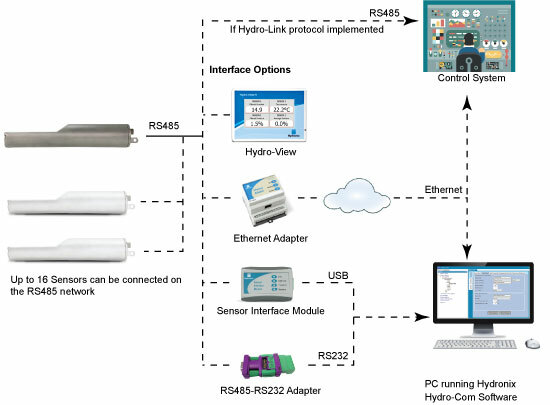 The RS485 serial interface allows up to 16 sensors to connect directly to a control system via a serial communications link. There are 2 analogue outputs which can be configured to 4-20mA, 0-20mA (0-10V), 1 configurable digital input and 1 configurable digital input / output. These different options provide the plant manager with the flexibility to select the most suitable method of connecting to their control system. There are various options for interfacing between the sensor and the control system using a Hydronix approved Ethernet, USB or RS232/RS485 adapter. Alternatively, the Hydro-View moisture display can be used to provide real time on-line process measurements including both moisture and temperature. In it's simplest configuration the analogue output from the Hydro-Probe can be connected to a Scaleable Current Loop Display to display the current moisture. These different options provide the plant manager with the flexibility to select the most suitable method of connection for their own control system.